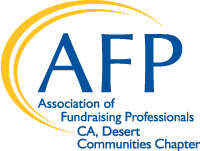 The Desert Communities Chapter, established in October 2006, is one of 244 AFP affiliate chapters worldwide. All AFP members adhere to a Code of Ethical Standards and are eligible to apply for the CFRE (Certified Fund Raising Executive) credential after five years in the profession. The majority of our Chapter Members work or volunteer for nonprofit organizations in the Coachella Valley. If you are not among them, we invite you to join as a member today. You will network with professional colleagues serving local nonprofit organizations, while participating in educational workshops, luncheon programs and audio conferences on a variety of topics relevant to effective and ethical fundraising practices. What you learn will benefit you personally and the organization you serve. Non-members are welcome to attend monthly Chapter programs and luncheons. Scholarship funds are available to individuals of limited means to attend educational programs, to join AFP, and to attend AFP's International Conference on Fundraising. The Desert Communities Chapter hosts a National Philanthropy Day Awards Luncheon annually in November with 500 guests in attendance. Civic/Service Organization award categories include Outstanding Philanthropist, Outstanding Fundraising Volunteer, Outstanding Fundraising Professional, Outstanding Philanthropic Foundation, Outstanding Philanthropic Corporation, and Outstanding Founder of a Coachella Valley non-profit organization. Award nominations are invited from AFP members and nonmembers each spring. Our Chapter is governed by a 15-member Board of Directors. Monthly board meetings are open to all chapter members who wish to attend. advances philanthropy by enabling people and organizations to practice effective and ethical fundraising. The core activities through which the chapter fulfills this mission include education and training, promoting credentialing, providing resources for fundraising effectiveness, networking, mentoring, advocacy and recognition of philanthropy.